Grady Memorial Hospital in Atlanta, Georgia. 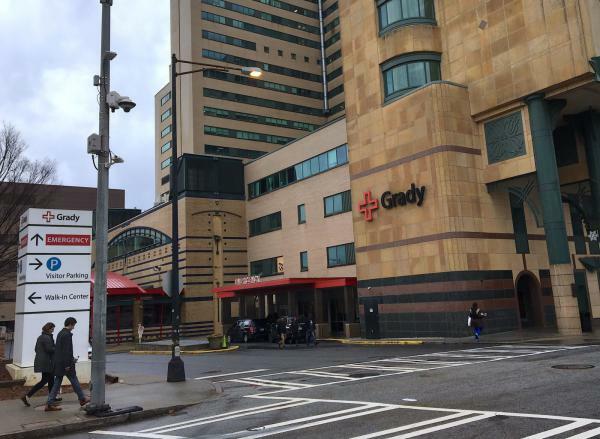 In 2018, Grady started it's version of a hospital-based intervention program called PIVOT. “And I started asking ‘What is going on?’ And the answer I was getting routinely from my colleagues was ‘Welcome to Grady. That’s just how it is here,'” Payne recalled. She said it was like everyone had just gone numb. So she did some research, and found a model that’s well established in other parts of the country, called hospital-based violence intervention. Payne successfully applied for a grant through the federal Bureau of Justice Assistance. The approach is designed to offer a menu of resources and support to gunshot victims, like educational support, job training and mental health services. It’s all in the hopes that they won’t end up back in the Emergency Room — or worse. Grady’s hospital intervention program is called PIVOT, and it’s about six months old. Aric Johnson is a licensed social worker at Grady, and he’s the guy implementing PIVOT on the ground. Grady Memorial Hospital social worker Aric Johnson outside where he meets most of his patients. 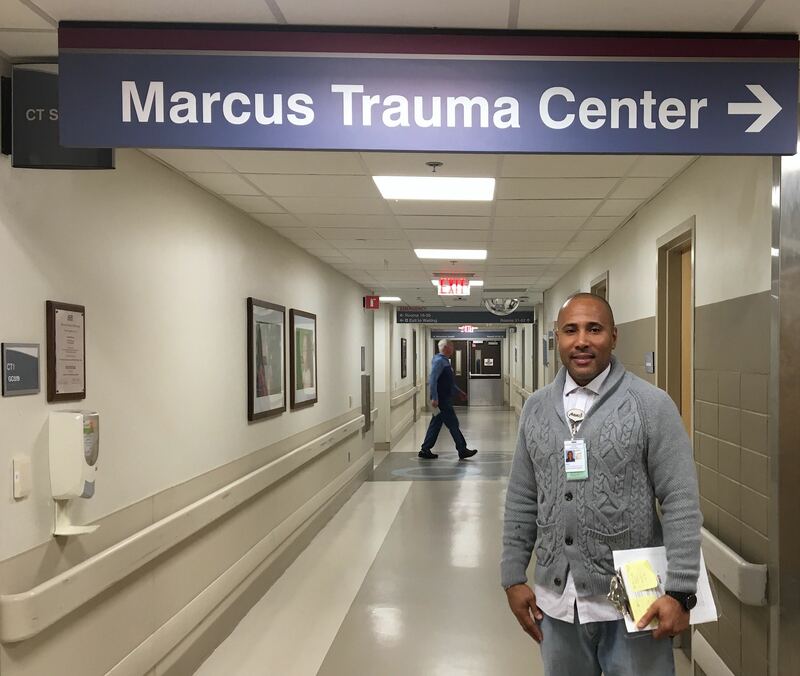 Johnson is the man behind Grady’s hospital-based violence intervention program, PIVOT. His task is to get that 19-year-old his GED, find him job training and maybe mental health care. Basically, to keep him alive. That’s because injury researchers have found that if you survive a gunshot wound, your likelihood of dying within the next few years increases significantly. That’s what hospital violence intervention tries to fight. For now, the PIVOT outreach is reserved for people shot in a select set of zip-codes, based on data from the Atlanta Police Department. They are all predominantly black neighborhoods with median incomes significantly lower than average for metro Atlanta. PIVOT is looking to follow a well-trodden path. Hospital intervention programs have been around for almost 25 years. So why is the approach just catching on in Atlanta? “In 1995, as a children’s hospital, we had an alarming number of firearm injured children,” said Dr. Marlene Melzer-Lange, a pediatric emergency doctor in Milwaukee, Wisconsin. The violence intervention program she helped start at Children’s Hospital of Wisconsin was one of the first in the country. Children were returning to the emergency room after having shown up the before because of fights or stabbings. The Milwaukee program, called Project Ujima, adopted an approach used to help abused children and applied it to victims of violence. On the other side of the country in Oakland, California, doctors formed a parallel model in 1994 at Highland Hospital. Over the years, similar hospital-based programs took root across the country. And in 2009, a handful formed the National Network of Hospital Based Violence Intervention Programs (NNHVIP). The network is working with the American College of Surgeons on issuing an official recommendation for trauma centers that treat a high rate of violent injury to create violence intervention programs. Word of mouth is the main way the model has spread according to Melzer-Lange. “I think people train in one place where there’s been such a program, and then they move to another place for their next job and they either start it up, or encourage other people in the new hospital to start up a program,” she said, adding that the number of applications to join NNHVIP is growing. If you look at a map of where these programs are, there are clusters: California, the Northeast and the Great Lakes region. In other areas, they’re spread thin. The South is one. The Mountain West is another. In Denver, Colorado, the AIM (At-Risk Intervention and Mentoring) program began 10 years ago, and remains the lone violence intervention program in the Mountain West region. “There was somebody from the city who came and wanted to do an assessment on youth who came to our facility with injuries, and their idea was to put out a survey in the waiting room for youth to answer if they were gang involved,” said Katie Bakes, an emergency physician at Denver Health and AIM’s director. Bakes wasn’t a fan of that original plan. But it got her looking for an alternative, which led her to the hospital-based violence intervention model. Last year, AIM did more than 200 bedside interventions. In the early days, Bakes said it was a balancing act. 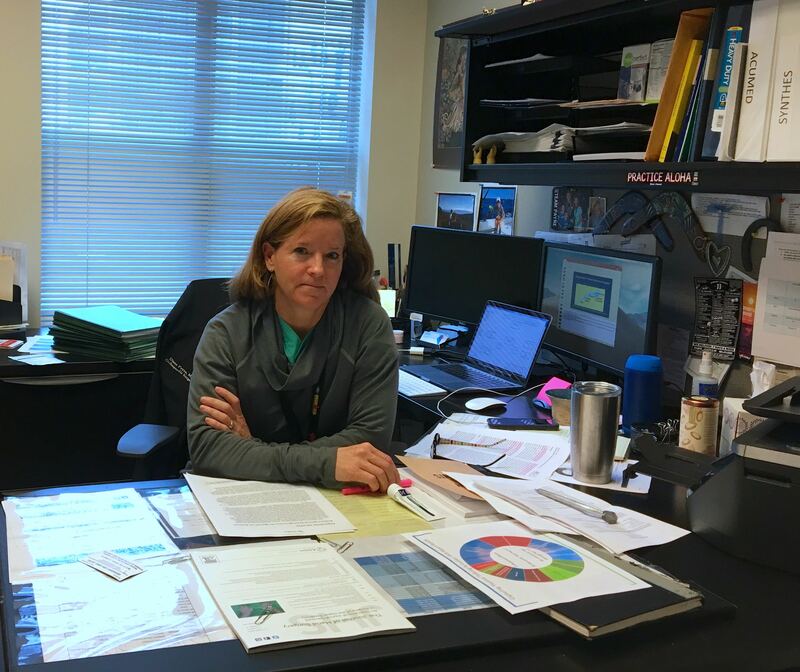 “One of the problems that programs like ours face is that funding is always an issue and so you end up working to get the funding as opposed to working on the program,” Bakes said. She thinks funding challenges may be what slows down geographic expansion as well. The AIM program is city-funded now, but she had no doubts there’s a need in nearby communities outside Denver. Culture also plays a role in why these programs have yet to sprout in some parts of the country, said Bakes. Like the AIM program in Denver, the Kings Against Violence Initiative in Brooklyn, New York, has also been around for 10 years. Dr. Rob Gore, who runs the program out of Kings County Hospital, says his dedication to violence intervention is personal. Earlier in his career, he worked in Chicago’s Cook County. “I looked around the [emergency] room and the only two people of color in that entire room was me and the clerk,” said Gore, who’s black. In Chicago, he found himself treating members of his own family, which was different from what his colleagues in the ER were experiencing. He thinks the growing national attention on mass shootings may have something to do with a the increasing interest in really understanding where violence comes from. In New York, Gore has been able to be vocal about the disproportionate impact of gun violence on young black and brown men. But depending on where you are in the country, hospital-based violence intervention programs may have to steer very clear of any message that can sound like political activism. In Atlanta, Diane Payne says PIVOT is about tackling a public health issue, full stop. Dr. Diane Payne has been working to bring violence intervention to Atlanta’s Grady Memorial Hospital. Social worker Aric Johnson said the work has been slow going, so far. Out of 80 patients who have qualified, just a handful have agreed to work with him. For Johnson, that’s understandable. The normalization of violence is just one of the many challenges Johnson’s up against. A lack of health insurance and a learned distrust of institutions are also major hurdles. He’s hopeful more support will come with time. Ideally, that will look like enough sustained funding to hire another social worker and allow the program to reach people in their neighborhoods. That has been a crucial part of making violence intervention work in other cities. The program is still in its infancy in Atlanta, which makes it vulnerable. Payne’s goal now for the program is a lot like what she wants for her patients: for it to survive and grow. Correction: This report has been updated to correct the spelling of Aric Johnson’s name. Guns & America is a public media reporting project on the role of guns in American life.